The closing ceremony to the most expensive Olympic games ever, four times the cost of the Sydney 2000 games was another spectacle from China that stunned the world. However even as thousands of performers danced and sang in front of members of the cream of Chinese and western corporate societies in the unaccountably expensive Bird's Nest stadium, officials were forced to admit that the whole of the Olympics has been staged by actors in the Arizona desert. "It wasn't just that little girl miming to an uglier girl's voice in the opening ceremony," said Chinese Premier Hu Jintao speaking in front of a green screen in a portakabin in Beijing. "The whole lot has been a fake, from the footstep fireworks of the opening ceremony to the tears of joy of our glorious winning communists. They were really tears of relief at not being sent to the labour camps for re-education with cattle prods and heavy rocks." Many conspiracy theorists said that they thought that some of the coverage did not match what you would expect from a country with so many social and environmental problems that has always had it’s own version of the truth. "If you look really carefully, during the closing ceremony the Olympic flag fluttered strongly as it was handed over to someone who is supposed to be the Mayor of London," said blogger Mulder Fox-Anderson. "But when he speaks, you can't believe he is real." Many analysts agreed that it was the sight of Boris Johnson representing London in front of nearly two billion people around the world that made many believe the whole of the Olympics must be some sort of fantasy. "Here we are, the world’s spotlight upon us, and there is some dummy waving the flipping flag around," said political commentator Huw Billingsworth. "You just think it must be a huge hoax!" Indeed it was the unrealistic movements and Benny Hill style presentation of the alleged Mr Johnson on the Beijing stage that gave a clue as to how the hoax has been perpetrated for so long. 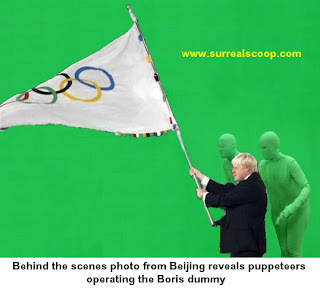 Behind the scenes photographs show that ‘Boris’ is in reality a complicated combination of green screen computer graphics and foam manipulated by puppeteers from Conservative Central Office. "If you listen carefully under the dubbing you can hear what Boris really says," said Fox-Anderson. "'Blimey, a flag eh? Cripes! Jolly interesting, not sure what it's for, is it Eton sports day? Which of the first years are the toast rack?'"